Devanahalli shot to popularity when the Bangalore International Airport landed right in its midst. A quaint town with roots deep in history was suddenly in the midst of six lane highways and land prices that would make even the hardiest faint. Back in 2005 Devanahalli was shedding its sleepy small town clothing slowly but surely. With the expressway, a whole new modern world drove right into Devanahalli at top speed. Soon proper shops took over the existing beedi tin shops. In place of lanes where bicycles were the main occupants, sixteen wheelers soon took over. In the midst of this massive change Devanahalli natives with even small pieces of land registered to them profited a great deal. Small time farmers with farm land next to the fort were offered upwards of Rs 50 lakh for one acre. Most people decided to give in and sell to the highest bidders. Devanahalli therefore has become a unique place where one can buy a coffee from an upscale coffee shop and saunter over to a temple built in the 16th century. Every turn in the road can lead one right to the front door of an ancient home or a temple. Signboards strategically placed point tourists in the direction of the fort and the temples nearby. A deceptively narrow lane leads up to the entrance of the actual fort. Signboards in Hindi, Kannada and English declare the fort as being the birthplace of Tipu Sultan. Spread over an area of 20 acres, the fort is a magnificent reminder of the power that the rulers held since the 15th century. The fort’s history begins with a small family of refugees who fled from Kanchi (Conjeevaram at that time). Their leader, Rana Baire Gowda dreamed up a harmonious settlement in the region where the current fort stands. His illustrious son Malla Baire Gowda was responsible for founding the towns of Doddabllapur, Chikkaballapur and Devanahalli. The area where the fort stands today passed from one royal patronage to another through time, from the Gangawadi to the Rashtrakutsa to the Nolamba and then subsequently to the cholas, Pallavas, Vijaynagar and Hoysala rulers. 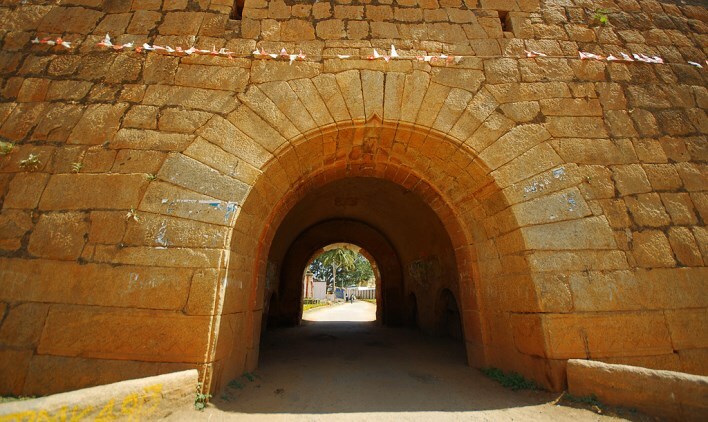 The land saw several royal patronages till the fort was constructed from mud by Malla Baire Gowda with the consent of Devaraya, the ruler of the area that was known as devnanadoddi at that time. The Wodeyars soon conquered the fort in 1747 under the command of Nanja Raja. The Marathas soon took over from the Wodeyars, only to lose it to Haider Ali. The fort as it stands today was a vision that came to life because of the Tigers of Mysore, Haider Ali and his son Tipu Sultan. The oval structure roughly faces east with at least 12 bastions spaced out across the fort at regular intervals. The east and west entrances have cut plasterwork adorning them. Although the entrances seem small by today’s standards, they were large enough to allow horses to comfortably pass through. Within the fort there are numerous hidden treasures like the house in which Haider Ali and Tipu Sultan called home. History lovers and enthusiasts can also revel in witnessing the house that a high ranking official under Haider Ali and Tipu Sultan lived in. Devanahalli besides being steeped in history is also famous for being the birthplace of the renowned Tipu Sultan. Today a small plaque marks his birthplace. The memorial features six foot tall enclosure with pillars and a stone top. A stone pond and plantations of banana, tamarind and mango beautify the area surrounding the memorial. There are numerous temples with impeccable architecture and religious iconography that have to be witnessed to be believed. Amidst all the temples, the Venugopalaswamy temple is the most visited and the oldest of all of them. Beautiful pillared statues and carved scenes from the Ramayana adorn the walls of the temple. A spectacular garuda stambha stands guard over the entrance. The sculptures found inside the Venugopalaswamy temple have been compared to those found in Belur and Halebid by various archaeologists and history enthusiasts. The exterior of the temple features a Shikhara built in the Dravidian style of architecture. The grandeur continues indoors in the sanctum sanctorum or the garbha gudi where the image of Venugopalaswamy can be found. The temple also boasts of a chariot that takes the Lord on a ride around town once a year. Other temples around the area are just as old and resplendent. The Siddhalingeshwara temple welcomes as many devotees as the Venugopalaswamy temple every year. The Chandramouleshwara temple, the Raghavendraswamy matha and the Sarovaranjaneya temple are other places of religious worship worth visiting in the same area. The fort as it stands today is a frame-worthy picture of a period long lost in the sands of time. The walls, the bastions and the entryways have seen numerous eras and people of all kinds walk through them. Simply experiencing the sudden calm within the walls of the fort is reason enough to visit. Tourists look at the fort as a piece of history and something that needs to be preserved. For the locals the fort and the temples are a part of their everyday lives. Little children play hide and seek in the long forgotten courtyards while old men sit around swapping tales of the days that have long gone by. Life for Devanahalli locals continues as it has done for many eons with small changes creeping in through the cracks in the fort’s walls. How to reach Devanahalli Fort? 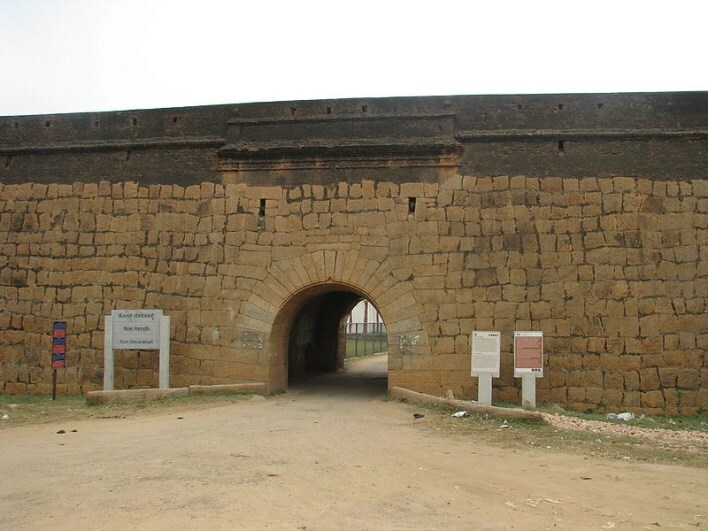 The Fort is approximately 35 kilometers away from the center of Bangalore city. One can either take a rick, hire a taxi or take public bus service to reach the place. The location is ideal for picnic seekers as it is en route to Nandi hills and is also close to Doddaballapur and Chikkaballapur. The historic picture postcard temples and the fort itself lend themselves to a wonderful day trip away from the hectic pace of the city.